If you have not linked your Permanent Account Number (PAN) card with your Aadhaar card yet, then you have time till 31st March 2019. According to the Income Tax department, all those whose PAN is not linked with Aadhaar would not be able to file income tax returns (ITR) and even risk cancellation of their PAN numbers. The I-T department has already given several extensions of the deadline to link PAN-Aadhaar numbers and now your last chance could be till 31st March. Earlier this deadline was 30th June 2018. Section 139AA of the Income-tax Act was introduced by the Finance Act, 2017 to provide for mandatory quoting of Aadhaar/Enrolment ID of Aadhaar application in income tax return (ITR) and for applying for allotment of PAN with effect from 1st July 2017. Section 139AA(2) provides that every person who has been allotted PAN as on 1st July, 2017, and who is eligible to obtain Aadhaar, shall intimate his Aadhaar on or before a date to be notified by the Central Government. In this regard the first order [F.NO.225/270/2017/ITA.II] was issued by the Government on 31-07-2017. In this order, the Government extended the due date of filing of return for AY 2017-18 from 31st July 2017 to 5th August 2017 and also prescribed the due date of linking of Aadhaar with PAN. The linking was required to be done before 31st August 2017. However, the due date for linking of Aadhaar with PAN was extended multiple times through various orders. The current deadline is 31st March 2019. Hence, it is mandatory to link Aadhaar immediately, otherwise PAN shall be deemed to be invalid. You can get your Aadhaar linked with PAN either through SMS facility or through the e-portal (websites of Income Tax department, NSDL and UTIITSL). Alternately send an SMS to 567678 or 56161 in the following format: UIDPAN<SPACE><12 digit Aadhaar><SPACE><10 digit PAN>. In case of a minor mismatch of data in PAN and Aadhaar, the Income Tax department will accept it for linkage after verification using a one-time password (OTP) sent to your mobile number. 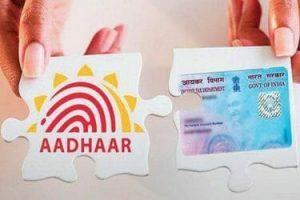 In cases where the name on the Aadhaar card is completely different from the one mentioned in PAN card, then the linkage is likely to fail and the individual will have to change their name in either of the two databases or personally visit a PAN application center of NSDL or UTIITSL for biometric Aadhaar authentication. After the Supreme Court of India upheld the constitutional validity of Aadhaar in September 2018, the department issued a notification making the linkage mandatory for all those who want to file ITR under Section 139 AA (2) of the Income Tax Act. Last month, the apex court had confirmed that linkage of PAN with Aadhaar is mandatory for the filing of ITRs. Thus it is advisable that one links his/her PAN with Aadhaar to avoid the consequences of failing to do so.